How Accurate Are Our Favorite Animated Animals? When animals take the stage they completely steal the focus, and leave us in an emotional lock, while our hearts melt over their lovable personality. So what if you got to meet them in real life? Would you still think the same of them? Let's have a look and get to know them behind the camera to see if they have the traits Disney, Pixar and Dreamworks have laid out for us. 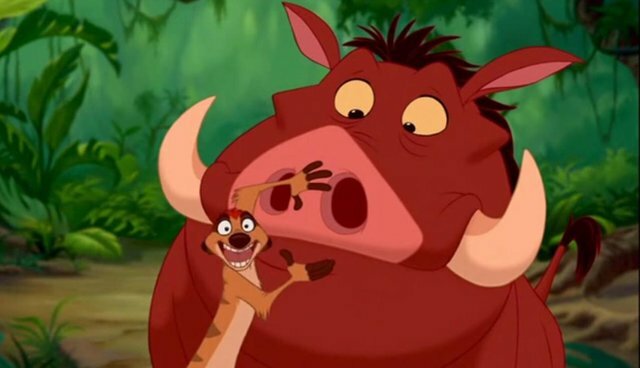 Pumbaa: One thing you won't see a wild warthog do is to feast on insects like Pumbaa. As a grass eater, warthogs are not threatening, and keep to themselves. Just like "Lion King's" adaption of Pumbaa, warthogs are more likely to run for a hidey-hole rather than fight. Their body is very warm (which is probably why Pumbaa has so much gas), so they like to be submerged in water and mud to cool down. Timon: Meerkats are in real life definitely not outcasts like Timon; they are an extremely sociable animal. They keep with their family and live together in large communities. Just like Timon is the decision maker, they are very alert, and always aware in the nature. If you are quick with your camera, you might also be lucky to picture a "Lion King" resemblance to Timon in the wild, of a meerkat eating an insect, as they are part of the meerkats daily diet. Meet Timon and Pumbaa in Namibia. Meet King Julien XIII in Madagascar. Meet Dory in Fiji or Australia. Dreamwork's "Kung Fu Panda," is a close called interpretation of a real life panda-personality, in terms of their eating habits. They eat fast, they eat a lot and spend about twelve hours a day doing it. However they are not considered obese like Kung Fu Panda. There is no time to be kung fu fighting in the real life of a panda, as to stay healthy they have to eat a lot - up to 15 percent of their bodyweight in 12 hours, so that's why they have to eat fast. A panda can peel and eat a bamboo shoot in about 40 seconds! Pandas are endangered, and there are only about 1,600 of them left in the wild, so it's a good thing they are not going on daring adventures like Kung Fu Panda. Meet Kung Fu Panda in China. Learn more about Frontier's wildlife conservation and marine conservation projects around the close to meet your favorite species in person.